As a development: Developing a speech, a scientific theory, a dissertation, working on a debate, or just spreading news. As an adult woman: She's a walking encyclopedia. Anything you want to know, this woman knows it, and as such she can mingle with almost anyone. She can talk science with the scientists, history with the historians, literature with the poets. She knows obscure facts, strange tid-bits, and she seems to love nothing better than to pour it all out, give it away like gifts to help people. In fact this woman is likely to be involved in a job that includes talking: psychology, politics, radio, or research. She might be a scientist, doctor or lawyer. Far-sighted, she is usually ahead of the game when it comes to new developments and will do many things-from cooking new cuisines, to using unconventional child rearing techniques-long before it's in vogue. All of which tends to make her appear eccentric. It's no surprise that men and women find themselves either threatened by her or fascinated. Her cool demeanor enhances her allure, making her the most "queen-like" of the queens, and her talent with words can be used to either lead one gently and persuasively over to her side, or tear an argument (and a person's self-worth) to pieces. Obviously, her style of parenting can seem "un-motherly" as she believes in offering up facts to solve problems rather than hugs and kisses. No one is better at intellectually stimulating her children, keeping them curious, helping them with homework or dealing coolly and effectively with emergencies. But she is lacking when it comes to providing emotional understanding and support. 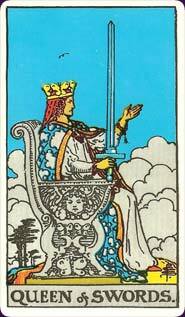 The Queen of Swords also likes to know everything, and she is likely to listen in on conversations, read e-mails, etc. Worse, she might well tell others what she's learned thinking it will do good. She means well, but her need to know and solve problems often outweighs other considerations. At her best, however, she is the queen of strategy. If there is a problem that needs to be solved, a puzzle worked out, the Queen of Swords is the one you want. Learn the Queen of Swords tarot card meaning and the rest of the card meanings, symbols and stories in our eBook.